After Grumpy Cat, sour-faced cat who became an idol on the internet, now appears Pompous Albert. Cats that this one is not only surly, but also has a deadly gaze. To the extent that it makes Pompous Albert eyes seemed to have an evil face. If likened to a man, this cat seems Bitchy Resting Face syndrome, which makes the face look always upset or annoying. Although it has a scary face, no doubt Albert remained a favorite Instagram users. Albert Albert Einstein's own name. 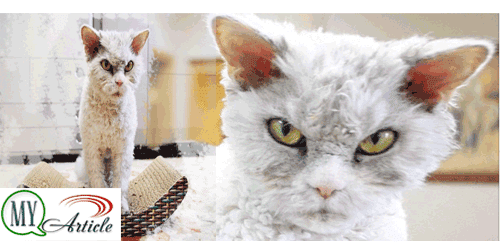 This cat comes from Selkirk Rex cat breeds rare, visible from the soft fur and looks frizzy. How do you think this cat just looks scary or funny?